European rabbit is the common rabbit, as usually seen. Amongst the various species of rabbit the most common one found is called European rabbit. European rabbit is also known as domestic rabbit. Deriving the name from its native land, the species is now spread all over other continents like Australia, Africa, New Zealand and South America. Mostly European rabbits are grayish brown in color and their undersides are pale color. Some white colored of the species are also found. 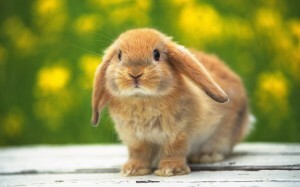 European rabbit has long, upright, straight ears. It is a furry animal. European rabbit is a quadruped animal, thus with four limbs and uses all the four locomotion. European rabbits are usually 13.5inches to 20inches in length. Tails of the European rabbits are 4cms to 8cms long generally. 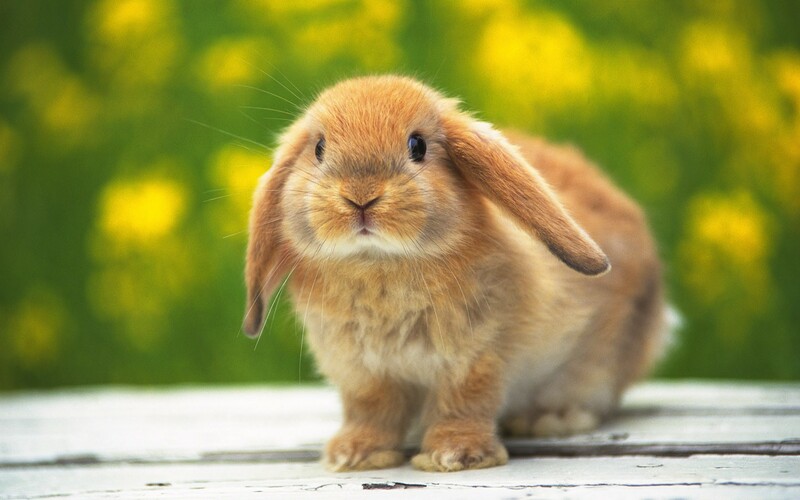 European rabbits usually weigh between 1kg to 2.25kgs. Female European rabbits are a little smaller in size than the male European rabbits. Female European rabbits weigh less than male European rabbits. This species of rabbits family is the most commonly domesticated species. This species is herbivorous. They survive on plants and weeds only. European rabbits are extremely social animals and thus they live in huge communities. 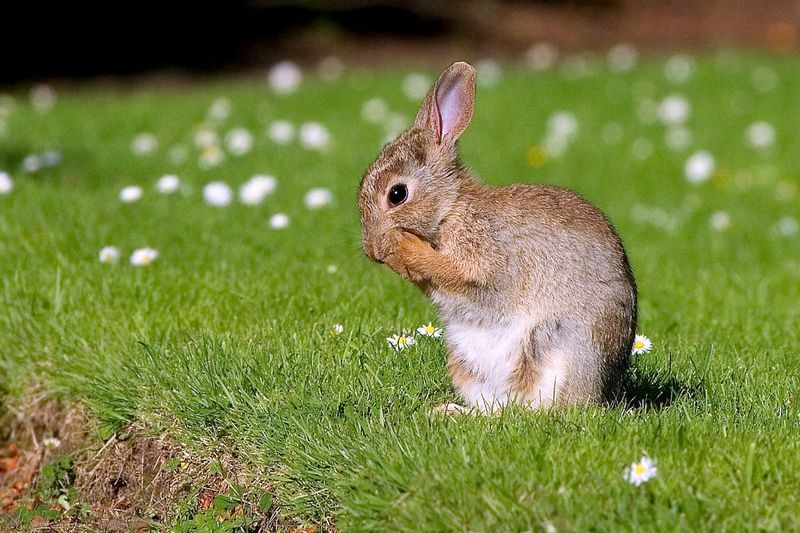 European rabbits secrete a liquid from the glands under their chins, spreads it to mark their territory. Within a few hours of reproducing the off-spring the female European rabbits mate again. When the European rabbits sense danger they thump their feet of the back on the ground to alarm others of the community before escaping the danger ground. 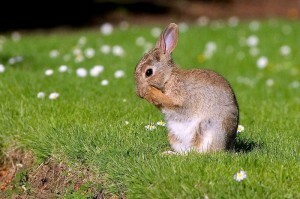 European rabbits are an invasive species as they cause great deal of damage to agriculture as well as the environment. European rabbits breed till the age of 6 years of age. European rabbits are herbivorous species of the animal kingdom. They feed on a large variety of vegetation. They eat agricultural crops, small plants, seedlings, cabbages, cereals, etc. Neck of European rabbits are supported by a flexible and weak neck that helps the rabbit rotate its head fast in any direction, helping to spot danger and food both. Eyes of European rabbits are set high on its head, as in all rabbits, it helps them detect food and danger from distance. The limbs of European rabbits are very flexible and they can run up to 16mts/sec. the limbs are also enabled to change the course of direction very quickly. The paws are endowed with claws that help them to grip the ground and dig as well. 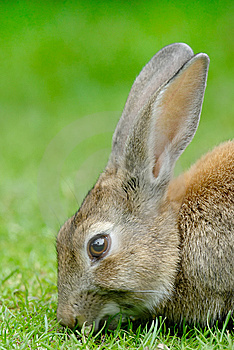 There are four incisor teeth in European rabbits which help them tear off plant parts. The molar teeth help them grind the plant parts. European rabbits reproduce very fast. This enables the species to give offspring faster and increase their species population, enabling the species evolving faster than others to adapt themselves according to the environmental changes. European rabbits derive their name from their native habitat, the continent of Europe. This species tend to be more active during the dawn and dusk. Rest of the day they tend to snuggle up near vegetation lands for shelter from predators. They move out for food during the dark. Native land of European Rabbits is Europe. The European rabbits can be found all over Europe. The species is also found in north-western Africa. Later the European rabbit species introduced to South America, New Zealand, and Australia. The species dwell in agricultural land’s edges, grasslands, woodlands, etc. where they can dig in the ground and reside. The European rabbits breed from the month of May to November. The female European rabbits reproduce the off-springs after 30 days of conceiving them. Therefore, the mating season of the European rabbits stretch from the month of July to October. This species of rabbit mate most of all during the first half of the year. European rabbits reproduce pretty fast compared to other vertebrate species of the animal kingdom. They reproduce throughout the year. A female European rabbit is capable of reproducing about many off-springs a year. Their mating season stretches throughout the year. 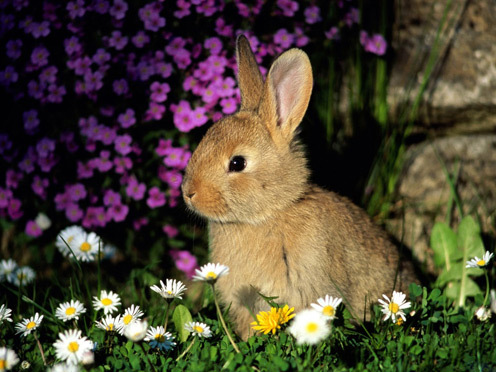 The female European Rabbits reproduce the off-springs within some 30days of conceiving. The kittens, as the nascent ones are known, stay under intensive care of the mother rabbits for a month. The kittens are born without eyesight, and body hair. By the age of 4-6months the off-springs reach adulthood and reproductive maturity as well. Average life span of European Rabbit is about 9 years. Only till a month or two at the most, the new born kittens stay under intensive mother care. Within that 9 year span it reaches reproductive maturity in 4-5months of age and continues breeding till 6 years of age. 1. Some bacteria affect the respiratory process of the European rabbits. 2. Some viral diseases like myxomatosis, rabbit pox, etc. infect the host cells of the rabbits’ bodies, affecting the cell growth of the European Rabbits, and in eventually resulting in causing tumor. 3. These rabbits also get infected by fungi, molds, yeasts, etc. 4. Some parasites affect the growth, reproductive capacity, and can even kill the rabbits. 5. Organisms like flatworms, tapeworms, flukes, hookworms, pinworms, etc. can affect the European rabbits, though might not be fatal. 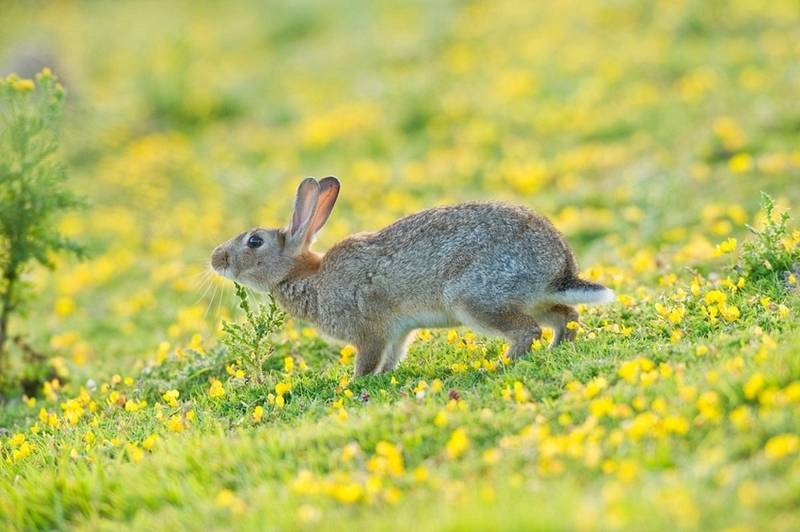 European Rabbits are a threat to the agricultural crops, which in turn threats the environment. That is why the species is called invasive species. Due to the huge population strength of the European rabbits, they are a serious challenge to the agricultural crops and environment. Between 1950’s and 1960’s the rabbits were purposely infected with the virus of the disease of myxomatosis to reduce their population. The attempt threatened the species seriously and they became endangered. But nevertheless due to their fast reproducing capacity and tendency they soon recovered the crisis and equals now to the same number as before. 1. European Rabbits are the most commonly domesticated rabbits. 2. European rabbits are a vindictive species to the agriculture, thus are direct threat to the farmer community and in turn to the environment. 3. In primitive days European rabbits were hunted down for food. The species is still hunted by some of the wild tribes in Australia and Africa. Being a very harmless creature in single number and a very friendly one, European Rabbit is a very adorable and widely domesticated species of the animal kingdom. Given its fast extremely active reproductive nature, the European rabbits should be kept in pairs if petted. This species is known to be invasive and thus are not warmly welcomed in agricultural areas.